Sometimes a developer will accidentally change the permissions on a file, and check in the change. It would be good to spot these changes before they cause problems, ideally as part of code review when looking at a pull request. The current web interface doesn't expose this information. Here's an example commit diff. Which files have changed permissions? The answer is both of them, but it's hard to spot. The fact that the latter is in the diff with no apparent changes is a hint that the second file has different permissions; I can't see anything to indicate the change in the first file. Even when I know the permissions have changed, I don't know what the old/new permissions are; this is also useful. @Jesse Yowell Sadface. It would still be nice to know if the executable bit has changed, but I see why I can't get the full file permissions. Setting to open status to place back into backlog. Closing as Jesse's comment above remains accurate. Sorry, but I don't understand the explanation. 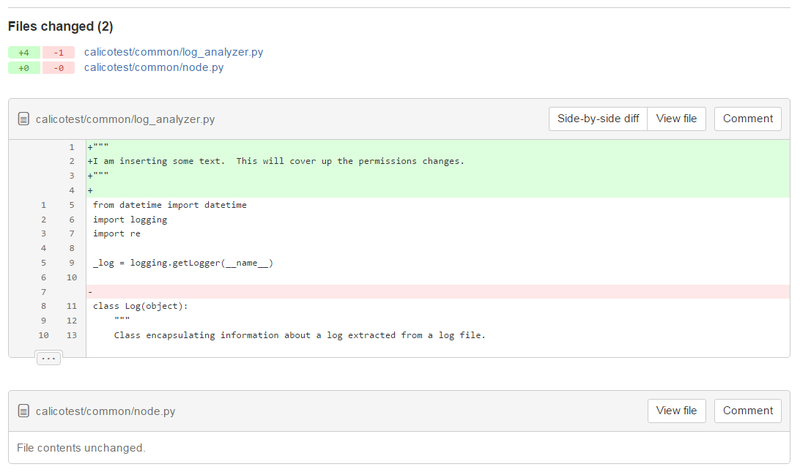 Git (and Bitbucket) support changes in file content, file name and file permission. If the file content or the file name changes, the Bitbucket UI displays this change this correctly. However if the file permission changes, the Bitbucket UI hides this change. Why? Saying permissions don't matter is like saying file name doesn't matter or whitespace doesn't matter. FYI, they do. File renamed but contents unchanged. while hiding my inadvertent mistake. One of the main reasons developers use nice UIs like Bitbucket is so that we don't have to hunt through these raw commit text messages. Just adding to this that the only way I could see the file mode change was to drill into the commit and view the raw commit using a link through the BitBucket UI. +1 This is definitely required. Like the reporter @Alex Chan said, reviewers need to see if a developer accidentally committed changes to the file mode.